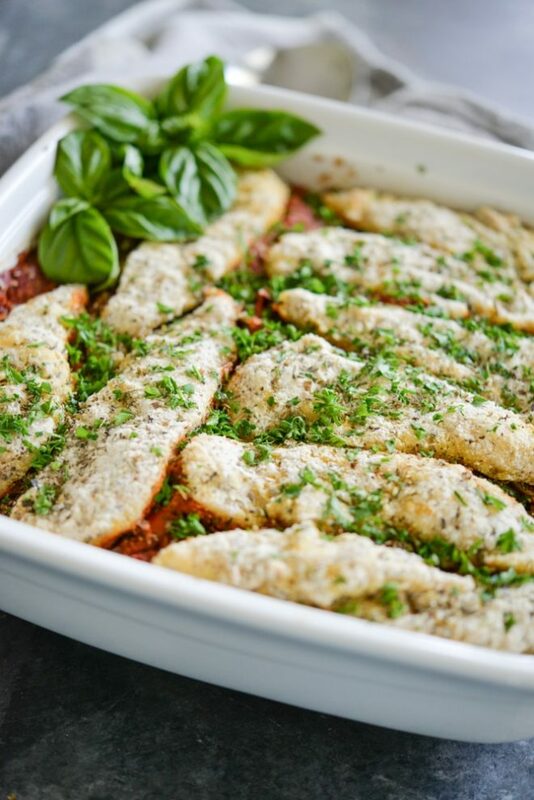 This Paleo Chicken Parmesan Casserole is a fabulous way to get a healthy dinner on the table in no time! 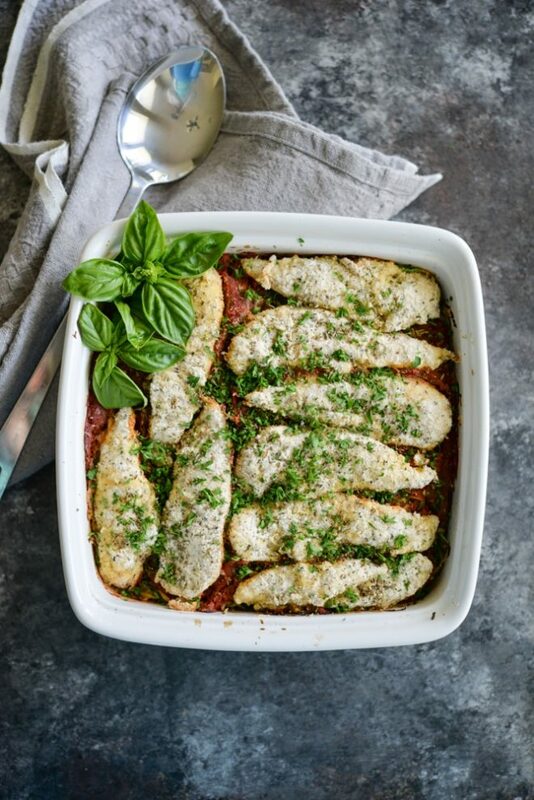 Before we get to today's delicious Paleo chicken parmesan casserole, can we talk about The Handmaid's Tale? It's one of the books on my Summer Reading List and, I finally made my way to it. GOODNESS, it is not what I was expecting and I could NOT put it down. If you follow me on Instagram and have checked out my Instagram Stories, you know that I love to consume stories via audio book. THIS particular one (also linked in the Summer Reading List I just mentioned), is a special edition. It's narrated by Clair Danes + a full cast. It also includes a special recent-day address by Margaret Atwood (author of the 1985 “instant classic”) where she also addresses how the novel was conceived, her intentions, and how it has been since received by the world. The book found its way onto my list because my sister-in-law was watching season 1 (a Hulu exclusive) and was “dying to talk to someone about it.” Sherin (my SIL) is extremely well-read and I wanted to know what had intrigued her so much. I GET IT NOW! I decided to read the book first and have watched a couple episodes of the (very well-done) show. Though the show follows the book closely in some regards, it deviates (I think for the better) in others. The Handmaid's Tale is a memoir of a woman, Offred, who is enduring an extreme and shocking change in society. The book describes a “dystopian” society (opposite of a “utopian”) and therefore, is not a feel-good. I don't want to give anything away here, but it's an interesting read. It's one of those stories that opened up a new part of my brain, causing me to see and think about things I hadn't ever seen or thought about. I LOVE learning new things and expanding my mind, which is probably why I was so interested by this book. Opposed to accepting a “science fiction” label for the book, Atwood argues that it's “speculative fiction” due to the fact that all the components in the book (methods, technology, ceremonies, etc.) are derived from REAL LIFE. When I finished the book, I dove down a “Puritan” research rabbit hole where I continue to learn about cultures I did NOT know existed. Apparently a book will receive the acclaimed “instant classic” label if it abides by this one rule: it becomes more true and potentially applicable to modern society with time. If you're interested in a mind-expanding, not feel-good, fictional Summer read, I highly recommend this book! PHEW, it feels good to get that out. Thanks for chatting books with me! I think one thing most of us can agree on here is that casseroles are THE frigging BEST. They're an efficient meal that packs a punch of vegetable, protein, and awesome flavors. I love them so much, I have an entire chapter devoted to casseroles in my published Fed & Fit Book. 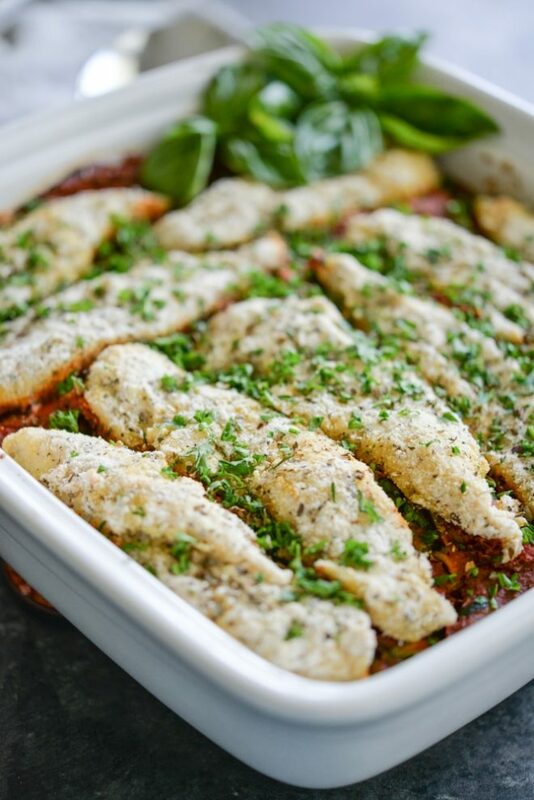 This casserole pays homage to one of my favorite Italian dishes of all time, Chicken Parmesan. 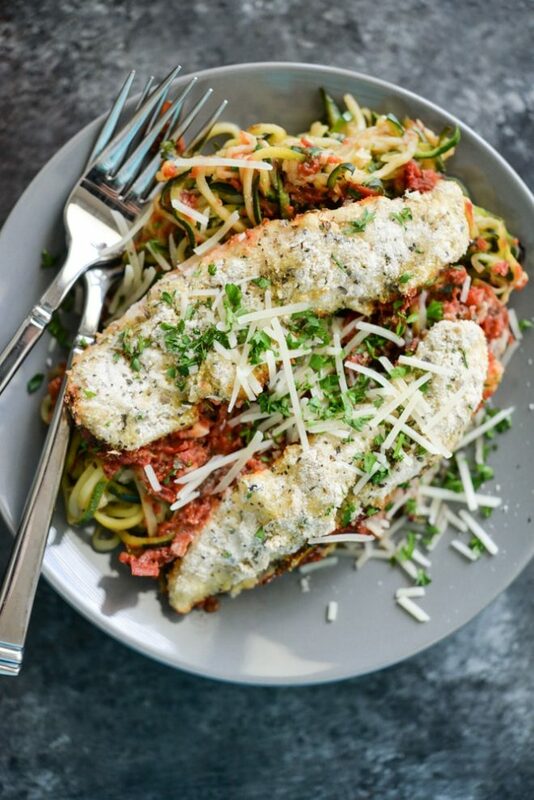 I have some lightly breaded (Paleo-friendly breading) seasoned chicken tenders nestled on a bed of marinara sauce (easy homemade recipe below or you can opt for store-bought), and a big bed of prepped zucchini noodles! 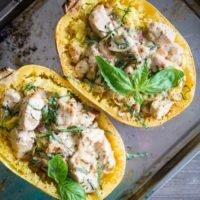 As for the noodles, you can absolutely substitute with spaghetti squash (if you'd like a few more carbohydrates) or even a gluten-free pasta (pre-cooked to an “al dente” texture). If you opt for zucchini noodles, know that I've got you covered with an anti-watery noodle finish. While it's near impossible to rid ALL the water out of zucchini, tossing the freshly cut noodles in a bunch of sea salt is a great start. More on this method below! For the noodles, toss the raw zucchini noodles with the sea salt and set aside for 15 minutes. Rinse the noodles of the salt and press to squeeze out as much water as possible (a LOT of water will come off because of the salt). Place the noodles in the bottom of a casserole dish. For the marinara, heat the butter with the garlic over medium heat until the garlic is fragrant. Add the rest of the ingredients and cook until simmering. Pour the marinara over the noodles. For the chicken, whisk the dry ingredients together in a small bowl. Dip the chicken in the egg and then into the dry. Place the chicken over the marinara. Garnish with additional seasoning and enjoy! 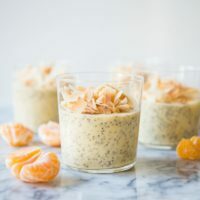 Okay – for starters, this recipe looks SO good!! Second thing…. I bought the book. After your recommendation, how could I not?!? 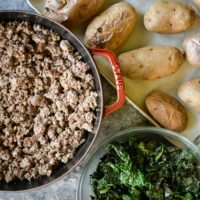 Thank your for the recipe and your recommendations! Uh, YUM! This is on the top of my to-do list for sure. I made this for dinner two nights ago to rave reviews! I used 2 zucchinis and the rest carrots (Trader Joe’s has frozen spiralized carrots–so easy), and even my pickier kids liked it. Thank you! 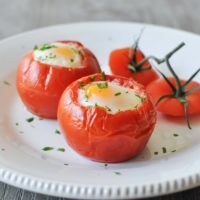 I consider myself a pretty horrible cook, but I tried this recipe, and am AMAZED how tasty it is! To make it even more simple, I just bought the already spiraled zucchini from whole foods! Thank you for such an easy and delicious recipe!! 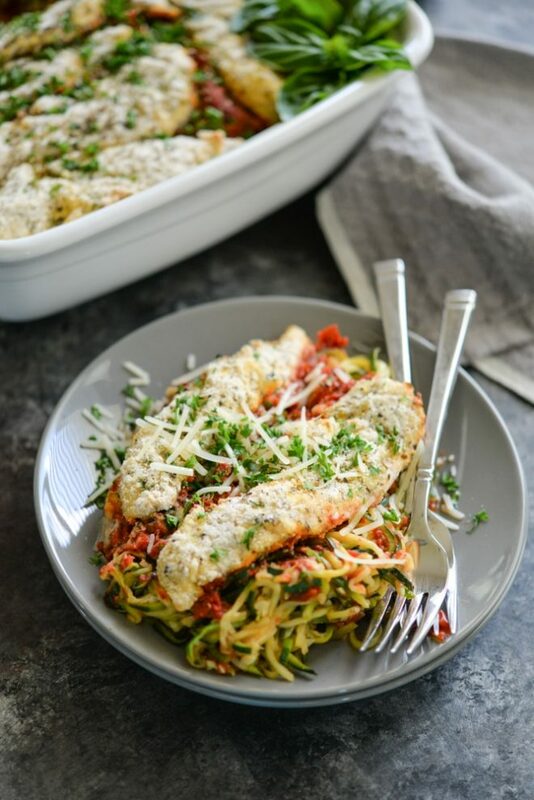 This was so good and my 3 year old loved the zoodles!